The time has finally arrived to announce the upcoming release of Back Roads and Memories, the Art of Don Rankin. The large format book, 9″ x 12″, will contain at least 200 images of my work spanning the past 5 decades. There will also be a leather bound edition, autographed, signed and numbered limited to 300 copies. This painting is a part of a larger story. The actual piece had its beginnings a little over 30 years ago. I just recently finished the work but I think there is a valuable object lesson to be shared. From time to time in my career I have been involved in painting portraits. One of my most unusual as well as gratifying opportunities came when a land owner commissioned me to do a portrait. Not an usual request. However, there was one exception. This “family” member was a prize bull. I accepted the challenge and the painting was well received and was hung in a prominent location in the house. During my time in the pasture I had an opportunity to see the light change and create many wonderful shapes as it played across the ground and the cattle. Milking time was inspired by that portrait session. Even though these cows had nothing to do with the bull and were kept in a separate pasture I was attracted to the light and the shapes they made as they patiently awaited milking. A few weeks later I began to piece together my sketches and ideas and began the painting in my studio. After a few days I just seemed to lose energy and questioned my original idea. I set the watercolor, still secured to one of my plywood boards, aside. As I wrote in the beginning that was a little over thirty years ago. Perhaps the rest of the story will support my wife’s contention that I suffer from packratism! Thirty years is a long time to ignore a piece of work that just somehow wasn’t clicking. At least in my mind I just couldn’t get up the enthusiasm to finish the painting. A few days ago I discovered the old watercolor after I had completed another work. It was patiently waiting, still secure and no worse for the wait. I looked at the old piece and decided that it did have some potential after all. I began to apply new washes with a great deal of intent. After a few days of glazing and dry brushing I consider it finished. Milking Time in it’s beginning stages. This photo was taken before I added any more work to the piece. It is a good opportunity for everyone to see what happens as more washes and refining strokes are applied. While I don’t really recommend waiting thirty years to solve visual challenges in a painting; it is often good to put a painting away for a bit of time. I recommend this if you are having a problem trying to figure out what is going wrong in the work. Putting a piece out of sight for 2-3 days can do wonders for your process. If you are terribly impatient placing your painting so you can see its reflection in a mirror will help you see areas that are not working. If you are a painter don’t be too hasty to trash a work just because you are having trouble solving your visual puzzle. Want to know more about glazing techniques in watercolor? From time to time I get questions about the strength of color in my paintings. Some want to know how I get such powerful luminous washes in watercolor. While the glazing technique plays a large role in the creation; there is another component. This is something that perhaps I have neglected to mention. FRESH PAINT: In order to fully explain I must digress to 1983. I was writing one of my first books on watercolor. Since I was writing I felt that I should get some technical data from the manufacturers that made what I considered to be the best watercolor paints. While there are a number of excellent paints these days; in 1980 there were two very popular brands in the USA. I made contact. Winsor & Newton was very open to discussing their paints with me. Wendell Upchurch was my contact. When we first began to talk, I asked him what was his job. His reply shocked me. He stated that his primary job was traveling around the country correcting all of the erroneous information that was found in so many of the watercolor books that were being written! He was delighted to spend time with me explaining the processes and the actual facts concerning producing and using quality watercolor paints. Needless to say we spent many hours discussing watercolor paints. Two Choices: Most watercolor painters in America tend to use watercolor that comes in a tube. Many painters in the UK and parts of Europe prefer to use tub colors. What is the difference ? Aside from the consistency the most important aspect is the degree of binder and preservative found in the paints. The colors that are packaged in tubs are a bit more tacky and they allow for constant re-wetting in daily use. Tube colors have less preservative and binder and it is suggested that one should only put out as much color as will be used in a day’s session. Many are accustomed to putting the tube colors on the palette and wetting and re-wetting the color until it is used up. Then more color is applied to the palette and the cycle resumes. In my early years I followed this pattern myself. Everybody Does it or Do They? Be honest, most people follow this pattern. However, a lot of painters have found a better way. You can test this yourself. Put out a little fresh paint, dampen your brush and apply a wash to a piece of paper. Rise out your brush and moisten a portion of the same color that has dried on your palette. Look at the results. Surprised? Want to know more about watercolor glazing techniques ? 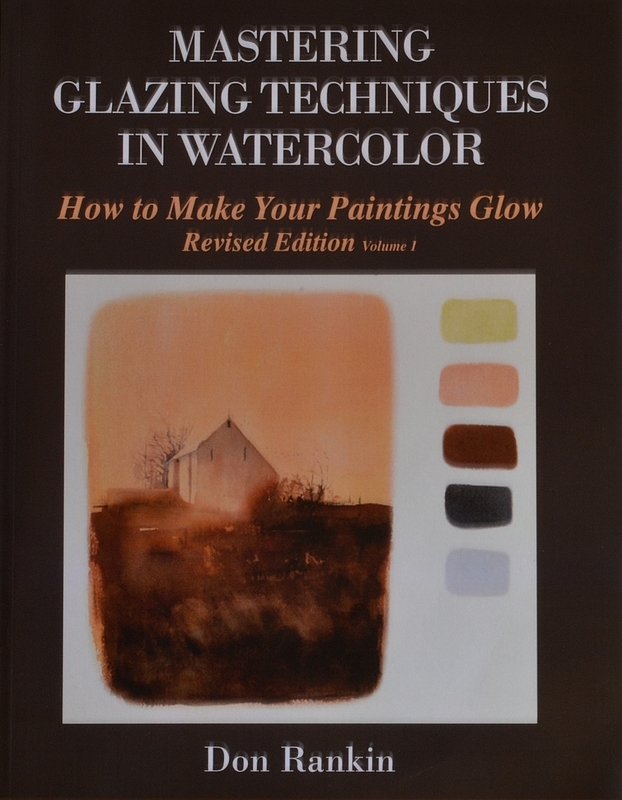 Mastering Glazing Techniques in Watercolor, Volume I by Dr. Don Rankin is available. Let’s Celebrate Light and Life ! Let’s face it; without light things would be pretty dismal. In fact without light there would be no life. In my painting career I have celebrated light in all of its incredible manifestations. Light and life go hand in hand. 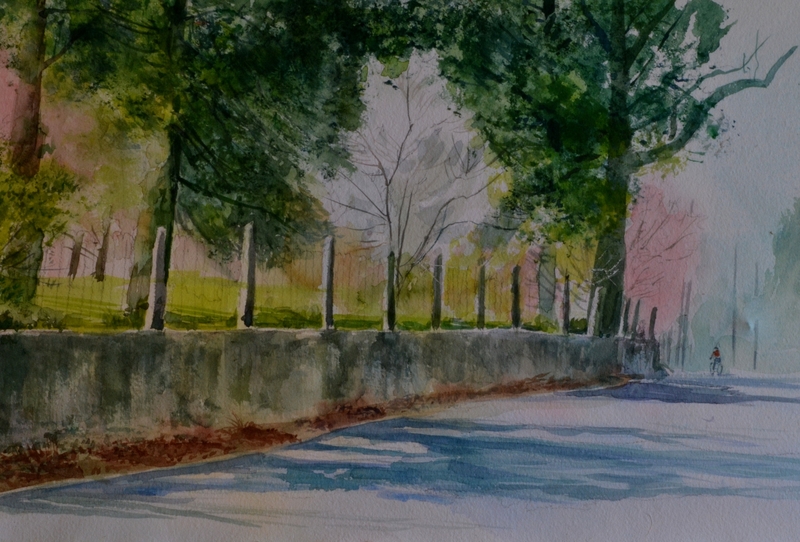 Toward that end I want to share a recent painting, actually this is a watercolor study. This study will be used to develop a larger egg tempera painting. This study has a story; so here goes. Animals have always played a large role in our household. Almost all of our furry children are rescues of one sort or another. The first cat came into our household when my daughter was around 8 years old. That has been more years than I wish to think about. So a little over 16 years ago my daughter, Carol, came to visit from one of her business trips carrying a furry ball in her arms. She had already been named Callie since it was obvious that she was a Calico. Callie had been rescued from starvation in a town where my daughter had been sent to do some field work. Callie needed a home and like others before her, we welcomed her into our home. As everyone knows cats are not like dogs and pretty soon Callie became pretty much the dominant pet in our home. There was one exception, our Golden Retriever mix didn’t like cats. There was always barking and snarling and threats but no bloodshed. Detente reigned. In fact it was quite comical. A little over a year ago Callie became quite ill and we went to the vet. They did a number of things for a cat that had been lethargic and with little appetite. Callie pulled through. Her personality changed. Our fairly quiet cat had become vocal and demanding, always seeking food. She started slipping out onto the deck in our fenced in backyard. She would sit for hours on the deck gazing and dozing in the fresh air. She would even brazenly strut close to Marley, our retriever, as if to say, “What are you going to do about it?” Talk about chutzpah, she displayed it in her final days. About two months ago Callie died and now rests under a stump in one of her favorite haunts in our backyard. At this point in our life she will be the last cat to grace our home. This watercolor was inspired by one of those moments when she sat in the sunlight in our den gazing out onto the deck she loved. The light seemed to illuminate her as she melded into the light. Little did I know that she was nearing the end of her days. I know that seems to be my common theme. However, I don’t think it can be said enough nor often enough. My point is simple. You are unique. Even if you have an identical twin no one sees like you do. No one thinks like you do. No one reacts in the same way to those things that happen around you. In short, your greatest asset is your unique individuality. To be certain all of us have shared feelings and shared viewpoints. In spite of that; your reactions are largely personal. While some may not see it our individual traits are our strongest asset. I am reminded of two very powerful events in my life that support my belief. When I was very young, about 14, I was admitted into the Famous Artist School, in Westport, Connecticut. It was my first experience with distance learning. I was absolutely amazed at the ability of the faculty. I recall submitting a project that was heavily influenced by one of my idols of the time. When my critique was delivered it was a sharp rebuke. It read something like this, ” I see you were heavily influenced by a particular artist, etc.,etc.,…in short why in the hell do you want to copy someone’s mistakes?” Mind you this piece was influenced by a very famous, extremely talented painter! Many years later I had the privilege of training for 25 years with Saiko Shihan Oyama of World Oyama Karate. Over a period of years one fact was replayed over and over again as young and old students would be demonstrating their knowledge of kata. Students would get nervous before and during promotion and they would glance to see what movements their neighbors were making. Almost always the neighbor would be doing it wrong! What is my point? Be yourself. To quote Shihan, ” If you make a mistake make it DYNAMIC!” Have the courage to stand on your own two feet and follow your heart. Sheeple get led around and never break out of the herd. While I stress individuality I do not stress it at the risk of producing quality. Learn the basics first. At the same time feel free to break out and explore. In the realm of exploring this small piece was produced on a French handmade paper that is well worth your time and effort. 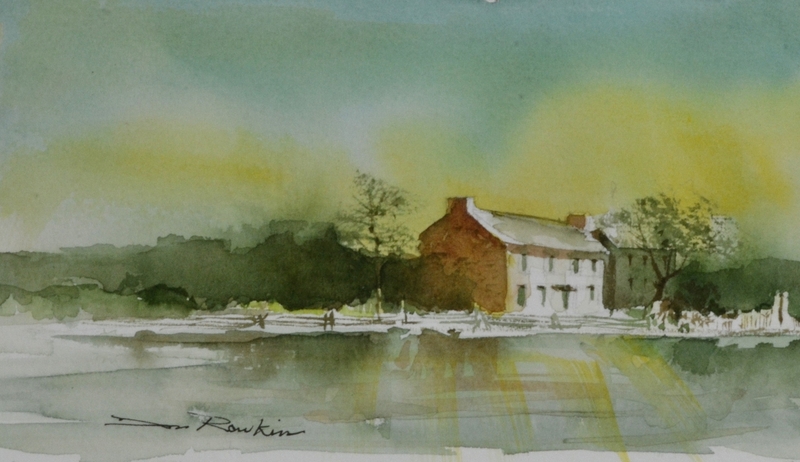 This watercolor was painted on a paper from Ruscombe Mills in France. I love the quality of the paper and the color hold out. I really have no complaints. You can find it by doing a search for Ruscombe Mills. However, I will give you a caution. READ the instructions that come with the paper. It will tell you to soak the paper and then mount it in order for the paper to smooth out. After all, this is handmade and it comes out with some ripples. At first you may think the paper is a bit thin or at least thinner than a number of commercially produced papers. Don’t let that fool you. This paper is strong. My first attempt at stretching resulted in disaster. I drew in pencil upon the paper and put the sheet in a tub of cold water. Since the paper felt lighter than other papers I placed the staples fairly close to the edge of the paper. While the paper was still very wet I washed in some Winsor and Newton Rose Dior and some random swatches of ultramarine blue. The very wet paper allowed the color to cascade down the sheet as it sat at an angle on my board. I left the room in anticipation of painting the next morning. That would give the paper time to dry and I would resume the process again. The next morning arrived and as I walked into the studio I could see that what I had judged to be a thinner than usual watercolor paper had the strength of a Goliath! The wire staples had pulled loose from the plywood mounting board, while some had ripped through the paper. The result was a wrinkled mess. I was fresh and relaxed and realized that I had misjudged the strength of the paper. I removed all staples and plunged the paper back into the a cold bath. After it soaked for about 10-15 minutes I placed on my mounting board. This time I positioned the staples at least 1/4″ from the edge of the paper. The sheet dried with a beautiful taut flat surface. This paper doesn’t disappoint. I’m glad that I bought several sheets. The washes in this painting are all transparent colors. I very rarely use opaque color and when I do it is for special effects only. The glazing techniques I employ do not produce vibrant color if you use opaque paints or body color. Those approaches block the light and kill the vibrancy of the washes. The surface of the Ruscombe paper I am using produces clean sparkling color. It takes dry brushing and seems to be open to washing back or lifting color if you desire. The paper holds a wide range of values with ease. The surface is tough enough to allow for scraping. I can say that this will be one of my favorite papers. Try it . I think you will like it. As I sit here and write this I am already making plans to visit a nearby orchard. More about that later. While this is a watercolor site I want to share a first with you. Coming in May at Artists on the Bluff, in Bluff Park, Alabama my son, David, and I will be having our first joint father and son show. The art center was once an elementary school that has been refurbished as an art center hosting individual studios as well as new class rooms for teaching artists. One of those new studios will be for my watercolor students. Say Bye Bye to 2014..Hello 2015! In a few hours 2014 will officially close. It will be a part of our past. Whether it is a time to reflect on good memories or to say good riddance is largely up to you. What did you accomplish in 2014? Did you achieve some or all of your goals? What lies ahead ? While I am not into telling fortunes I do think it is wise to formulate some plans. Perhaps it is a good thing to take a hint from some pretty smart people from the past. One suggestion is to make a list. Draw a vertical line down the middle of the sheet. On one side list all of the good things; in the other column list the not so good things. See which one is in the majority. This approach is said to help in weighing decisions. I think all of us make plans but do you write them down? It is reported that those who write their plans down on paper have a much greater success ratio than those who don’t. It is said that statistically there is a remarkable difference in the outcome of merely dreaming about it and writing it down. It seems that we are wired that way. If you don’t already do it; give it a try. It couldn’t hurt! A lot of people write a lot of things about organizations. Does it help to be a member of this society or that group? I think the answer is up to every individual. However, I want to share an idea with you. A dear friend of mine, who is retired, like me shared an insight. I would give credit for this story if I knew the original author. Hopefully I will not butcher it because I will be paraphrasing. It is a story about Canada Geese. 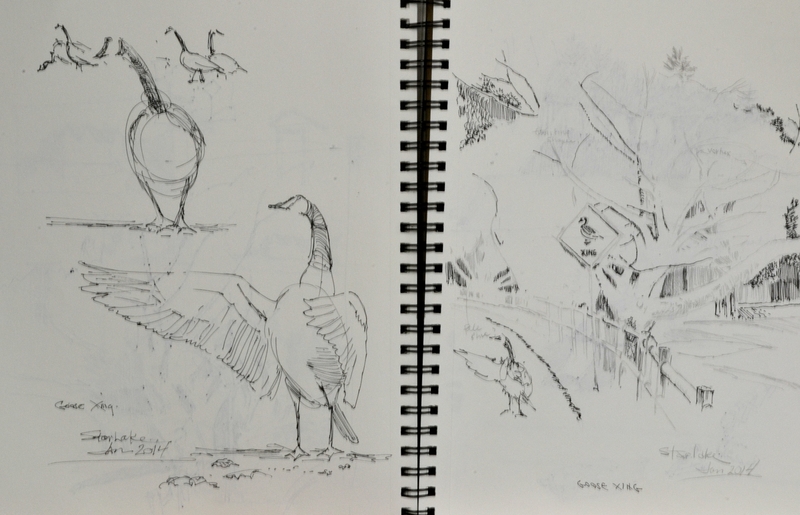 For a number of years I have enjoyed watching and sketching them as they congregate at a nearby lake and on the creek that flows behind my studio. I love watching them as they wing their way down through the valley over Paradise Creek and produce their sounds. Have you ever noticed their formations? Being social creatures they help one another out. When flying in a V formation the lead bird is taking on the air currents and making a slip stream for his/her companions that are flying behind. They get to ride the slip stream provided by the birds ahead of them in the formation. When the lead bird tires another takes the point and falls back in the formation. Geese mate for life. When a bird is sick or injured its partner stays with it until it can recover and eventually return to the flock. Do you think we can take a lesson from these wonderful creatures? We are supposed to be smart, the top of the food chain but how often do we overlook the qualities these simple creatures seem to embody. Think about it. Can We Help One Another ? 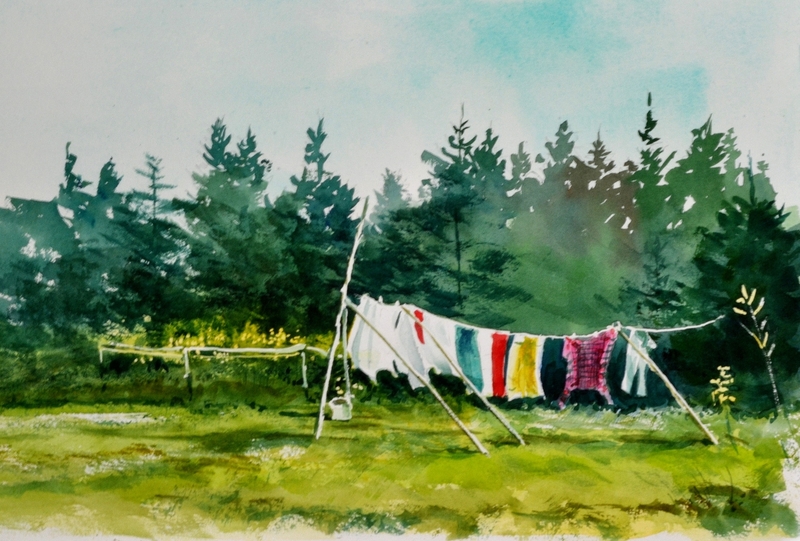 Now what does this simple story have to do with watercolor? Perhaps a great deal can be learned from it. I get a lot of correspondence from people who are concerned that watercolor is not as respected as oils. There are concerns about prices and selection in juried exhibitions. I hear more of this today than I ever did years ago. My son is a painter in oils who also happens to be talented with watercolor. Lately he shared with me that some of his associates encouraged him to drop watercolor in favor of his oil technique. It would seem that there is a growing group of ignorant people. This ignorance seems to be spreading even among educators who should know better. I will not go into great detail but the raw truth is that the average beginning watercolor painter who is using good materials (quality paper ,etc.) has a far greater chance of producing a lasting watercolor than the beginning oil painter. This fact shocks many people. The reason lies in education. There are several variables that can affect the stability of an oil painting. The use of a proper ground, the overuse of turpentine and more. Proper education is the key. If you can accept the previous premise, what can you do? Educate yourself and others. You don’t have to be rude but first and foremost make sure you know your medium. Respect it enough to learn all you can. This is a life long journey. Learn all you can about other media as well. Sadly, a lot of educators today do not know as much as they should. This is not always their fault. Be careful what you hear and what you accept. Seek accomplished instruction. There are many good studios, workshops and individual teachers. 1. What am I most proud of this year? 2. How can I become better ? 3. Where am I feeling stuck? 4. Am I passionate about my work? 5. When did I feel most creatively inspired? 6. What projects have I completed ? 7. Have I allowed fear of failure to hold me back? 8. Do I have old habits I need to let go? Want to know more about watercolor glazing techniques? 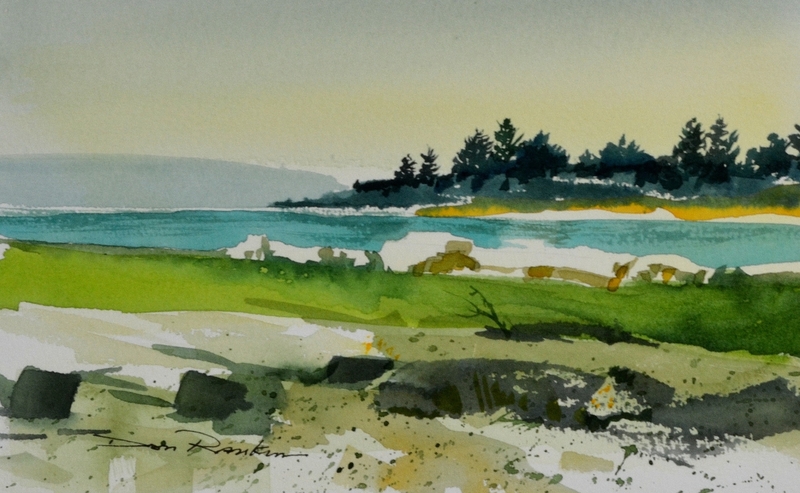 Want unlimited access to watercolor glazing techniques by Don Rankin on-line? Study at your own pace…. 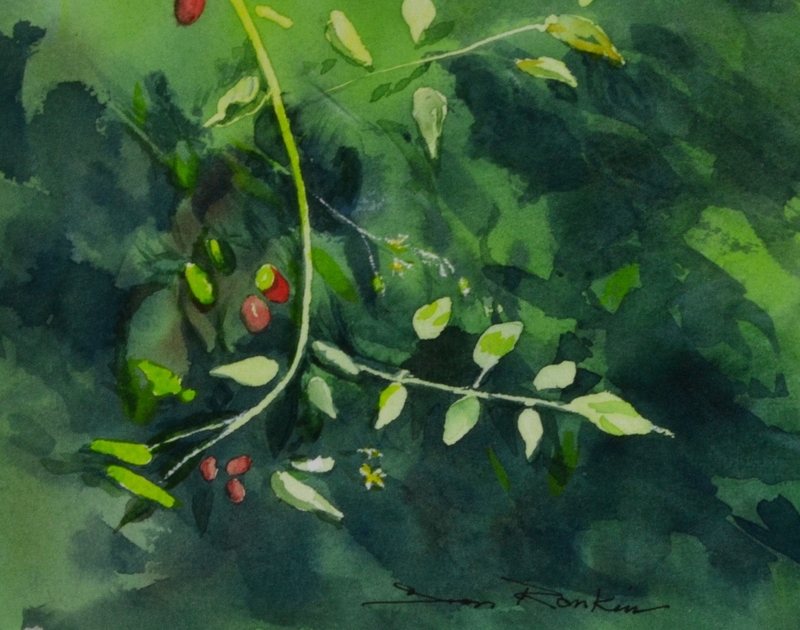 Summer 2016 WATERCOLOR WORKSHOP WITH DON RANKIN….contact Edwina May at Cheap Joe’s Art Stuff, Boone, NC. I would like to invite anyone reading this post to attend a very special Invitational Exhibition. WHEN: the opening will be on Wednesday, December 3 from 1:00-8:00 PM with a preview on Tuesday evening, December 2 from 5:00 pm-8:00pm. In this post I am sharing 3 of 5 new pieces that will be on exhibit in December in Chadds Ford. I thought I would share a little bit about these pieces and how they came to be. As the name implies all of the chosen works are miniature. All of the pieces are the result of direct on site experience. Some of the works were derived from older sketches that were not painted immediately after they were drawn. I’ll try to explain that a bit more fully in the following narratives. Many years ago I was honored to exhibit regularly at the Chadds Ford Gallery. Being invited to participate in this years show brought back a lot of pleasant memories of past associations and past sketching trips in the area. In most of these pieces memory and nostalgia play a very important role. The show will feature the works of about 42 artists; many with ties to the Brandywine Valley region. At times I like to change up my routine. For those of you familiar with my site you know that I like to paint outdoors or at the very least I prefer to develop my sketches from life and then finish my works in the studio. Why life? While cameras are wonderful inventions I have yet to find a camera that can “see” what I see in a subject. Colors, textures and a whole host of other sensory data just isn’t always captured in a photo. Granted I have a fine digital camera and I wouldn’t be without it. However, I find I spend more time taking photos of my finished works than using it to capture subjects for painting. Having written that statement I do want to assure my students and readers that I will use a camera if time or other circumstance dictates. Of course many of my students are already well acquainted with my sketching and painting habits. I’ll never forget my first encounter in Maine. I love the rugged coast line and the beautiful pine trees. The atmosphere, the breeze, the colors and everything about the landscape intrigues me. In fact, I have enjoyed not only the State of Maine but the entire New England experience along with the Maritimes of Canada. I have many as yet unpainted pieces that are recorded in my sketchbooks. This small piece is just one of many possible attempts. A great deal of the content of my books on watercolor technique were derived from my experiences in those areas. In the past few years I find that my memory seems to provide a very compelling sway over a lot of my work. I’ll explain. My memory seems to distill a scene or an encounter eliminating the non essential, leaving the bare bones of the subject. I also find that personal experience embeds itself into the act of painting in a far more powerful way than merely working from a snapshot. I look for subjects I know, subjects that are familiar. There are times when I will walk past a tree or a landscape taking note of certain characteristics. However, it may take years for me to get hold of that subject with enough clarity that I will begin to paint. There are also times when I walk past a certain familiar spot or object and it is as if I suddenly “see” it for the first time. It may be the way the light is falling on it or a combination of shadow and light. Suddenly, at that moment, I see the subject in an entirely new way. At times I like to savor the moment and will often “paint ” a subject in my mind before I put a brush to paper. I don’t have a hard and fast rule about painting procedures but I do find that as I get older I tend to take more time with some subjects. Perhaps I have less and less to prove and I can just enjoy the process of creating my watercolors and egg temperas. Grape Tomatoes was painted in my backyard while looking off the edge of my deck. I’m probably not really considered a successful gardener. In fact, my wife suggests that I would do better going to the local farmer’s market instead of putting time and money into a few plants. However, I do try to raise a few plants every year. The growth of the plants and their shapes and colors intrigue me. This miniature piece resulted from watching the vines sway in the afternoon breeze as they cascaded off the side of my deck. The trees and the woods that border my deck provide a backdrop for the stream that flows a few hundred feet from my studio door. The swaying shapes in the wind along with the ever changing colors and the sounds of the stream provides a challenge. While a camera may not record the sound my experience of being there gives me a perspective that can’t be fully explained. I have made mention of memory. Here is a perfect example. This watercolor is the result of a sketch I made many years ago. It was a cold February morning in the community of Chadds Ford, Pennsylvania. I had been summoned to discuss a project with the Franklin Mint in nearby Wah Wah, Pennsylvania. I was staying in Chadds Ford and the morning was cold and crisp. As a part of my habit I was making sketches and the cold was seeping through my bones. I made several fairly quick sketches that day while on my way to the mint. I have several sketch books and this sketch got buried or better said forgotten until a few weeks ago. After being invited to participate in the 33rd Annual Christmas in Miniature Exhibition at the Chadds Ford Gallery I found this old sketch and the result is this small piece. While the actual sketch is almost 30 years old it brings back the initial experience in a very powerful way. If I go back to the site it may no longer exist but it will forever exist in my memory. As I have said before perhaps my present reliance on memory is due to age or perhaps some would say I am living in my past. Whatever, I try to find what works for me. The bottom line is that everyone must find what works for them. All too often editors ask that we write about technique, choice of paper, brushes and paint. No doubt that helps the editorial mind. However, I can’t help but think that WHY I paint a subject is far more important than HOW I paint it. Perhaps you agree. The paper is not really new. In fact Twin Rocker has been around for quite a while. It is an American hand made paper and you can order on line. A few months back I was posting about various challenges some of my students were having with paper. If you paint you know some of the stories. Some painters will shy away from hand made paper because they either fear the price or they are troubled about quality. As a lover of paper I am always looking for great paper. I purchased a few sheets of Twin Rocker along with a French hand made that I will feature later. This paper is Twin Rocker 22″ x 30″ cold press A. I love the feel and I love the action. It has a hard surface and takes a good washing and is marvelous for drybrush. The color hold out is superb and the dried washes sparkle. The paper is tough. It can take scrubbing out as well as scratching out with a sharp knife. It will also take masking without disturbing the surface of the paper. I have several more sheets and even though I have quite a bit of paper Twin Rocker will remain high on my favorites list. Keep in mind that I pay full price for my paper just like you so I have no monetary incentive to hype some one’s product. This is a very recent watercolor but it has a long history. I’ll explain. In an earlier post I wrote about the fact that the sketches in my sketchbooks are not in chronological order. It has always been my habit to pick up the book that is near at hand. I’ll shuffle through and find a blank page and begin to sketch. Consequently, you can flip a page or two and note that some sketches are many years apart. Perhaps this will drive many people to distraction but for me the book is a tool. When I am in need of something to draw on I get the one that is readily available. At times I will go through the studio and attempt to organize things and sketchbooks and put them in some sort of order. After all, at some point a book does fill up. At that point it is no longer in my easy to reach stack. Perhaps I am a bit too frugal in that I really don’t like to waste pages and I try to make use of every page in a book. You could say that I discovered this sketch in one of my books. Mind you, it had been there all along yet for some reason I had overlooked it. Better yet, in my philosophy, I found it when I was ready to see it. I actually experienced this spot on a summer trip to Maine many years ago. I sketched it and fully intended to paint right there but for some reason it didn’t happen. In reality I have a life time of sketches and ideas from Maine to Nova Scotia. In fact my first two books were compiled while in that region and many of the pieces at that time were influenced by my trips into that beautiful land. Due to current technology many of my readers will have no frame of reference for clothes hanging on a line in the summer sun. My connection is my childhood. Every Monday was wash day in the Rankin household. The only thing that prevented or delayed that ritual was terribly inclement weather. If it happened to rain or snow for a few days clothes would dry in the house. However that was unusual. I can remember my mother taking a dampened rag and walking along cleaning the clothes lines before putting the fresh wash in the lines. I can still see her wicker wash basket and canvas bag that held her clothes pins. In my mind’s eye I can still hear those sheets and some articles of clothing flapping and flowing with the breeze . It wasn’t hard for a small boy to imagine that the sheets were huge sails on a pirate ship popping as the wind stirred them. When the clothes were dry and brought into the house the crisp fresh aroma of the outdoors permeated the room. At that time in my life air conditioning did not exist but the moving breeze through the open windows added to the wonderfully fresh aroma. This sketch brought back all of those wonderful memories full of sounds and smells. A writer once wrote that you can’t go back. Well, maybe he is not quite right. In reality I think I know what he meant and on some levels I agree. However, my sketchbook is my time machine. I use my sketches to propel me back to the moment so that I CAN smell the smells and hear the sounds. Granted, no doubt, much of the unimportant is forgotten or perhaps my mind remembers it the way it wants to. Regardless, there is a remembrance and I like my mind’s colors and memory better than most photographs. As I age I find even more treasure in solitude and the limited quiet of my backyard that settles near a lively creek. Perhaps there is a connection, I have always loved wilderness and now I am not as able to explore the wilderness so I draw upon memory. Want to know more about Mastering Glazing Techniques in Watercolor? Enjoy a remastered classic watercolor tutorial. NOW IN DVD format . 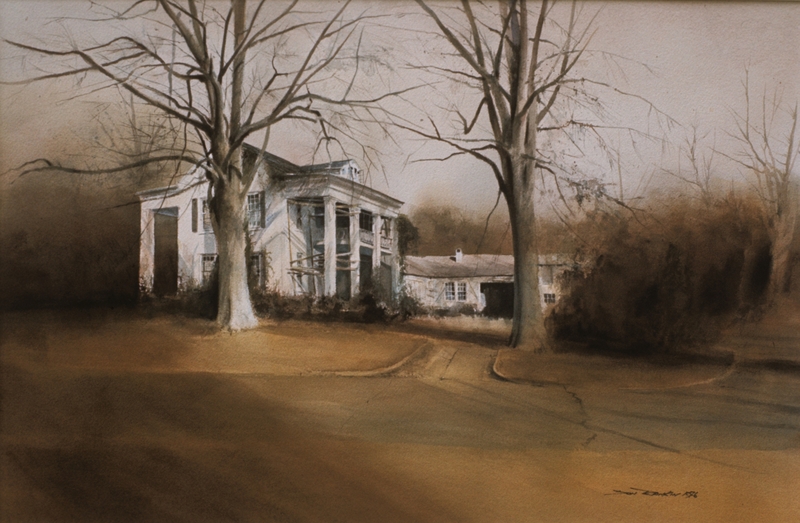 You can enroll in a 2.5 hour watercolor course on watercolor glazing techniques by Dr. Don Rankin. The course covers paper basics as well as paints, along with color discussion with theory and basic painting techniques. Enroll now for lifetime access. You can enjoy at your convenience and go at your own speed. 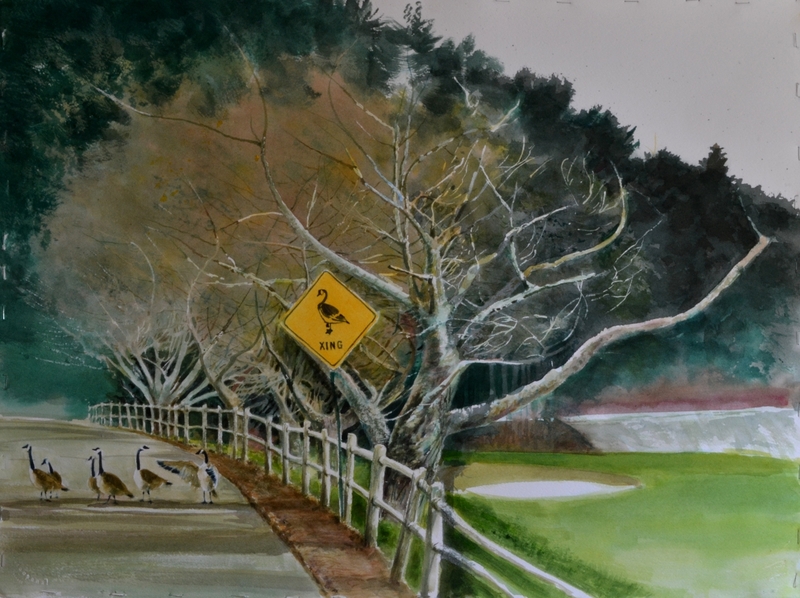 Coming soon a full tutorial on Goose-Xing…a recent painting. I make no excuse for the fact that at times I slow down and work very slowly. I think all of us need to find our own rhythm. Some subjects develop quickly; others need to be savored like a fine wine. At least that is my philosophy. I have been working or perhaps I should say thinking on a subject for a few years now. It is a common ordinary neighborhood street. A tree lined street that is traveled regularly by a lot of friends and neighbors. The two lane street weaves its way past a golf course on one side and a pleasant lake on the left. In the spring and summer months the lake has more visitors than in the winter. Regardless, it is a local gathering place for young and old, walkers, joggers and moms and dads with strollers. Usually they are carrying lots of stale bread for the feathered inhabitants. Nearly 35 years ago we began to receive new neighbors….Canada geese. If you don’t live on the edge of the lake perhaps you find them more enchanting. If they are overrunning your yard and your deck you may not feel so charitable. None the less they are now permanent residents. Since their presence is firmly established they even have their own traffic signs. It seems that the local human population has learned to adapt. It is not uncommon to see joggers take to the street to avoid a collision when the local goose population calls for a congregational meeting on the side walk. At times the group will choose to slowly move across one of the streets to a feeding spot in a nearby yard or return from their foray heading back to the lake. Whenever they cross, motorists slow down or come to a complete stop to allow the feathered residents to parade across the road. To human credit I see little sign of injury to any of the feathered pedestrians. Earlier, I mentioned tree lined streets. At the edge of the golf course there are groups of ornamental fruit trees marking the boundaries of the course. Over the years I have painted several of these trees and incorporated some of their characteristics into sketches as well as paintings. I am greatly intrigued with their shape, color and texture. They have a presence that begs to be painted. I have indulged my passion for several years in that regard. I have tons of sketches and planned paintings that have not yet matured to the point of becoming paint. In this case the sign haunted me for several months. I had never seen such a sign warning of a Goose Crossing. I am very familiar with Deer signs and have seen my share of Elk and Moose signs in my travels. However, a Goose Crossing was a new element. I though about it. I stared at it. I would drive by slowly and just look at it. Finally, I began to sketch it and some of the local feathered actors. It is impossible for me to separate the process of thinking and sketching. However, for clarity I have broken these two elements into preparation and sketching. Preparation= contemplation. Sketching= bringing that contemplation into form. My personal taste is drawn to more direct observation and sketching with less photography. Don’t misunderstand, I own a great Nikon and I use it. However, I am more in tune with my own perceptions. In too many cases I find the photos don’t “see” or record the subject the same way my eyes and my memory does. As I have gotten older I have become less dependent upon the photo. Naturally there are times when the camera is absolutely essential. I’m merely trying to convey that I’m more concerned with my personal vision. I fill up a lot of sketchbooks and I must confess that I often pick up one or the other when I need one. This has resulted in a group of sketches that are in no chronological order. In some cases there may be sketches on facing pages that are years apart in execution. No doubt that will disturb the neat and orderly ones. However, it is what it is. Lately I have had a couple of art dealers who have admonished me to become more orderly. 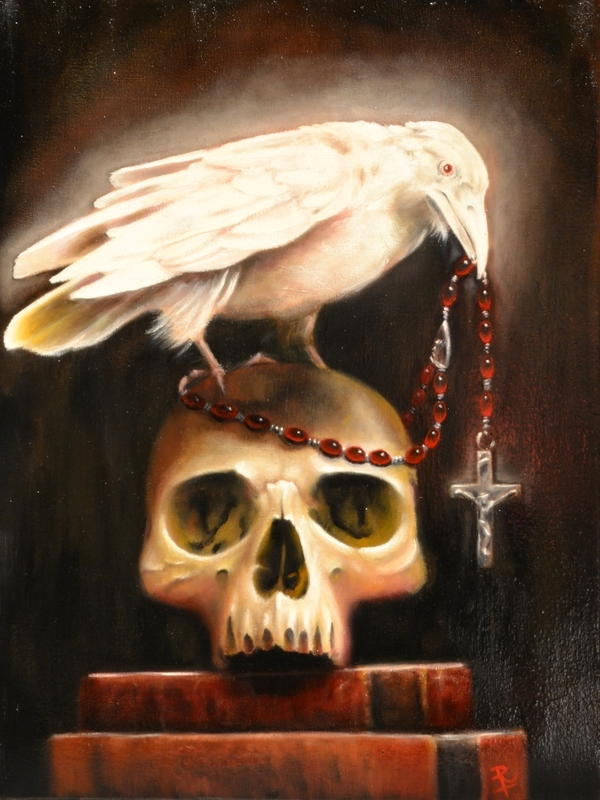 I am making progress I now have a fairly accurate inventory listing of paintings along with where they reside. At this time my sketchbooks are still a bit of a chronological disaster! Most of the time I use a refillable TomBow pen with black ink. Several years ago a dear colleague gave me one as a present. Since that time I have gone through about three or four. I tend to lose them and later find them in a jacket or pants pocket. I also use markers of varying widths. I find pencils to be messy and somewhat wimpy when I am in the field. I do own quite a few and use them regularly in the studio. Outdoors I like an instrument that is devoid of an eraser. It helps keep me focused. Color is personal. As I began this piece I wanted to keep it low key but I wanted color. I chose to work with complementary combinations. Red and green were the primary agents I paired colors like Perylene Maroon with Permanent Sap Green and Hookers Green. Holbein’s leaf green with American Journey Copper Kettle. Other colors included Transparent Oxide Yellow, Gamboge, Andrews Turquoise and Joe’s Blue another American Journey color. As stated earlier, color is personal. I paint in summer as well as winter. I love the cloak of muted colors as the plant world slumbers awaiting spring. When I look at the fungus on an old growth tree I see a riot of color, I also see silvery greys and tawny muted ochres. I try to create these colors with color combinations rather than using dull faded color. Experiment with the quinacridones. They are extremely transparent and can be manipulated in mixed combinations placed directly on the paper or they can be used in glazes to create vibrant jewel tones as well as lively yet subdued winter color. The painting Goose Xing has been recorded for instructional purposes. It is under going final editing. It will probably be several hours of demonstration. At this time the final cut is uncertain. It was painted in real time and will be available in a few weeks. ISBN 9781463749033: Mastering Glazing Techniques in Watercolor, Vol. 1 Around $34.95 retail. The top image is the current revised, updated edition of Mastering Glazing Techniques in Watercolor, Vol.1 by Dr. Don Rankin. Most of you know that is me of course. This re-issue was published in 2011 and carries a completely different ISBN number than the original 1986 edition. You can see the current number posted in the caption below the cover shot. Due to popular demand this book was revised and updated with some new tutorials. The story of this revised edition is a bit long and I’ll not bore you with all of the details. I was blessed with about 5 books being published by Watson-Guptill Publications. 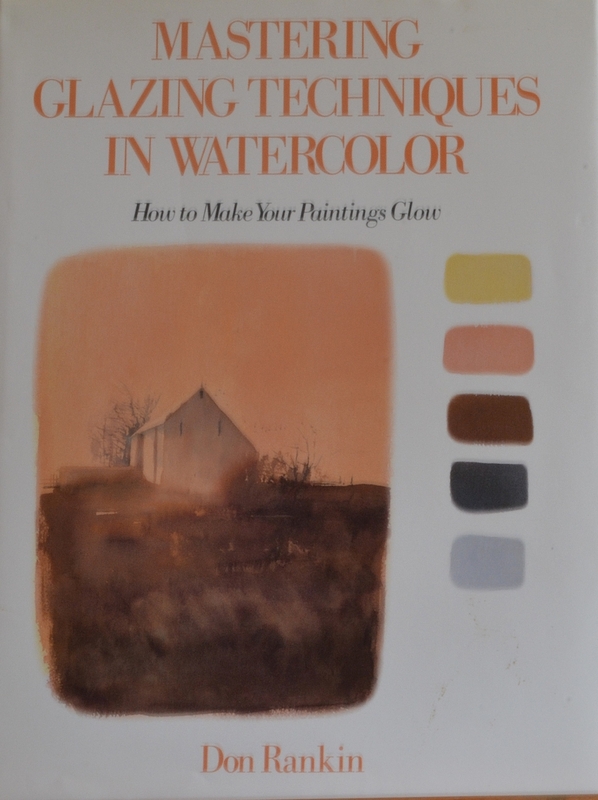 Mastering Glazing Techniques was a big hit and was credited with being the first authoritative book ever written on watercolor glazing techniques. Other watercolor books followed in the series. Several foreign language editions were also produced. Due to their popularity it was decided to halt publication of the English editions for about 6 months and produce a large volume anthology of all of the books in one large edition. The idea was to produce a greater demand. Mastering Glazing marketing & publication was halted along with three other editions. My editor left the company with a promise that our project was safe. Not so. This edition (Hard Cover) was issued in 1986, halted in the 1990’s at its peak of popularity. It was never offered in paperback. In the meantime I had resolved to not write any more books and to spend my time painting. Very soon this edition was being offered on line at enormous markup. I began to get cards, letters, long distance telephone calls and finally many e-mails asking if I would re-publish. After so many requests and a number of conversations with associates I decided to re-publish with revisions. I could say more but hopefully you get the idea. Many of you have run into frustration over confusion at Amazon.com. when you go to look for the new book. In a lot of cases you get the picture of the old edition and it may have a tiny link to a paper back edition. That will or should lead you to the new book. Even worse you may scroll down a line or two and see the brown cover book for sale at prices of more than $50. Those are resellers, they are not retail. They sell it for $50 and I get a $2 royalty! Sorry if that sounds petty but it is true. I’m not angry mind you. That is how the market works and I am glad that there is a market. But some of you have contacted me asking why the price was not in agreement with prices I have quoted. So in self defense I am sharing this with you. I am grateful for all book sales but once again BUYER BEWARE! If you decided to buy, you have two options; you can use my direct link: http://www.createspace.com/3657628 and the book should be about $34.95. The publisher will not allow a lower price. Feel free to go to Amazon.com, select “Books” (yes, it seems to make a difference on some servers) use the ISBN NUMBER in the search: ISBN9781463749033. You may get a prompt telling you that no such number exists but alongside or right below you will see the picture of the book. Go figure! Amazon will often offer the book for $31.95. Hopefully this post will answer some of your recent questions. I have tried to simplify a long tangled story. I hope I haven’t belabored the point. If you have any questions, please feel free to contact me. Again I thank all of you for your support.